How to Keep Rolling After a Fall by Karole Cozzo – August 2. Nikki was ostracized for her role in a cyberbullying scandal, and Pax, a quad rugby player, shows her that everyone deserves a second chance. A Torch Against the Night by Sabaa Tahir – August 30. Can’t wait to read the sequel to An Ember in the Ashes! For This Life Only by Stacey Kade – August 30. Jace is struggling after the death of his twin brother, and Thera helps him to adjust. Vicarious by Paula Stokes – August 16. Winter and her sister Rose grew up in a Korean orphanage and were later trafficked into the US. Rose disappears and Winter tries to solve the mystery. Enter Title Here by Rahul Kanakia – August 2. Reshma is a top student Silicon Valley high, but to get into Stanford she has to set herself apart. She gets a literary agent and decides to change her story to be more of a typical high schooler. Will her story have a happy ending? 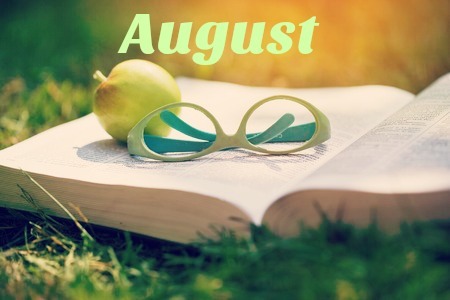 A Week of Mondays by Jessica Brody – August 2. Ellison has a particularly bad Monday and wishes she could have a do-over, and she gets her wish! Over and over. Georgia Peaches and Other Forbidden Fruit by Jaye Robin Brown – August 30. In this book about faith and sexual identity, Joanna meets the perfect girl for her but has promised her minister father to keep the fact that she’s a lesbian under wraps while they settle in at a new town. Unscripted Joss Byrd by Lygia Day Peñaflor – August 23. Joss is a popular young actress who is dealing with the pressures of fame, a demanding director, and a power hungry mom on the set of a gritty indie film. All We Have Left by Wendy Mills – August 9. This 9/11 story is told in past and present about two girls coming of age during a life-changing, devastating event. Swear on This Life by Renée Carlino – August 9. A writing instructor is disturbed to find that a hot debut novel seems to be based on her own childhood, which means her long lost first love must have written it. The Girl with the Lower Back Tattoo by Amy Schumer – August 16. I don’t know Schumer’s work that well but I love a humorous memoir. Another Brooklyn by Jacqueline Woodson – August 9. In this novel, August reminisces about her and her best friends growing up in Brooklyn in the ’70s. All the Ugly and Wonderful Things by Bryn Greenwood – August 9. This unlikely/controversial love story has gotten a lot of buzz and I’m so eager to read it. Results May Vary by Bethany Chase – August 9. Caroline discovers her husband is having an affair with a man and starts to question everything she thought was true as she makes a plan for the future. The Regulars by Georgia Clark – August 2. Three best friends take Pretty, a magical tincture that makes them gorgeous. But there’s a dark side to this sudden gift. Furious Rush by S.C. Stephens – August 23. Mackenzie is a rookie motorcycle racer who falls for her rival in this series debut. The Couple Next Door by Shari Lapena – August 23. This thriller is about a couple with a missing baby – did the parents have something to do with it or maybe the couple next door? Suicide Squad – August 5, wide release. Based on all the Harley Quinn’s I saw at Comic-Con I imagine this will be a big hit! But I’m still waiting on reviews though, personally. From Baz Luhrmann and a team of collaborators including four-time Oscar® winner and fellow executive producer Catherine Martin, legendary MC and executive producer Nas, associate producer Grandmaster Flash, Pulitzer Prize winning playwright, co-creator and executive producer Stephen Adly Guirgis; and expert collaborators, including hip-hop historian and supervising producer Nelson George, The Get Down is a mythic saga of how New York at the brink of bankruptcy gave birth to a new art form. Set in New York in 1977, this music-driven drama series chronicles the rise of hip-hop and the last days of disco -– told through the lives, music, art and dance of the South Bronx kids who would change the world forever. Bachelor in Paradise – ABC, August 2. Okay I’m totally embarrassed to say I watched this season of The Bachelorette (first time watching this franchise.) Blame this stressful election? Anyway, I’ll probably tune in to see what this series is all about. Brooklyn – HBO, August 13. A lovely coming of age about an Irish girl making her way in Brooklyn in the ’50s. Can’t wait to see it again. The Little Prince – Netflix, August 5. This feature length animated film is making its debut on Netflix. Based on the classic novel, this film features an all-star voice cast. The Wine Show – Hulu, August 13. This UK series is making its US debut on Hulu this month. The Wine Show stars Matthew Rhys (The Americans) and Matthew Goode (Downton Abbey, The Good Wife) as they discover the best wine the world has to offer, with the help of some wine experts. XOXO is an ensemble comedy about a group of 20-somethings on a crazy adventure to the biggest EDM festival in America, XOXO. The film follows six strangers whose lives collide in one frenetic, dream-chasing, hopelessly romantic night. At the center is Ethan, a young DJ who gets a last minute slot to perform after his tracks go viral online days before the festival. This is a huge opportunity… if he can just make it there in one piece. What are you watching and reading this month? Another Brooklyn is so good. I want Georgia Peaches and Other Forbidden Fruit but was denied on Edelweiss. I’m excited about a few of these as well. I love the Georgia Peaches cover! I still need to read Bethany Chase’s first book. I hope I love it as much as everyone else seemed to. Ooo I love all of your picks! I’m super excited for A Torch Against the Night and Enter Title Here, so hopefully I can get ahold of those! I haven’t heard of any of your TV picks, though.